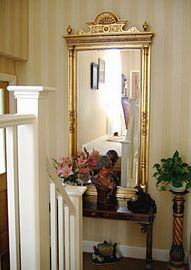 Amber House is a beautiful Victorian double-fronted house, ideally situated in a quiet residential street, yet less than 10 minutes walk from the attractions of York city centre. 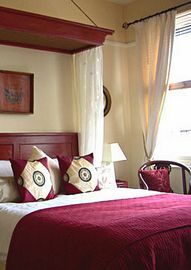 Beautifully decorated and furnished, Amber House offers a warm welcome, and relaxing bed and breakfast accommodation in elegant surroundings. A perfect choice for taking in the sights of York, and also offering easy access to the outer ring road and the beautiful Yorkshire countryside. En-suite facilities with walk in shower cubicle, toilet and washbasin. Guest towels - bath sheet and hand towel per person. Breakfast is served in our spacious dining room from 8.00am - 9.00am. Enjoy the choice of full English, Vegetarian or Continental. All guests are issued with a front-door key and are welcome to come and go as desired. Special Diets Provision: Special diets are catered for. Vegetarian options available. We will endeavour to cater for special diets with prior notice. From the M1, M62, or the A1 (approaching from the south), take the A64 (York/Leeds) towards York. Ignore all signs to York until you see the A1237 (outer ring road). Take this road, and go straight ahead at the first four roundabouts. At the fifth roundabout - signposted A19 (York/Thirsk), *turn right towards York. After approximately 2 miles, you will come to a set of traffic lights (just after a church on your left) - go straight ahead at these lights and look for a footbridge which spans the road. Bootham Crescent is then the second turning on your left hand side. Take the A59 to York, turn left onto the outer ring road(A1237). At the second roundabout - signposted A19 (York/Thirsk) follow the instructions from * above. Drive into the centre of York. After you pass the Mecca bingo, get into the right hand lane and turn right onto the inner ring road. You will pass the Barbican centre on your right, and the city walls will be on your left. Go straight ahead at the next four sets of traffic lights. At the fifth set of lights, enter the left hand lane and turn left into Gillygate. Turn right at the next set of lights, onto Bootham. You will pass Churchills Hotel on your right hand side. Bootham Crescent is the next turning on your right. Turn left out of the station forecourt and keep walking straight on at the first set of traffic lights; the road will take you underneath the city walls. Keep bearing left and you will cross a bridge over the river. After crossing over the bridge, you will see the entrance to the Museum Gardens on your left hand side - walk straight through the gardens and at the other end, turn right and walk up Marygate. Turn left onto Bootham and keep walking until you pass Churchills Hotel on your right. Bootham Crescent is the next turning on your right. Low Season: October to March inclusive, from £64.00 to £74.00 per room per night. High season: April to September inclusive, from £74.00 to £80.00 per room per night. Supplements will apply for bank holidays. Minimum of 3 nights stay over bank holidays. Please note we are closed from 23rd December to 26th December 2007 inclusive.